Palazzo Vecchio is the symbol of the city of Florence, together with Santa Maria del Fiore and Michelangelo’s David, and has always been the seat of the city government. 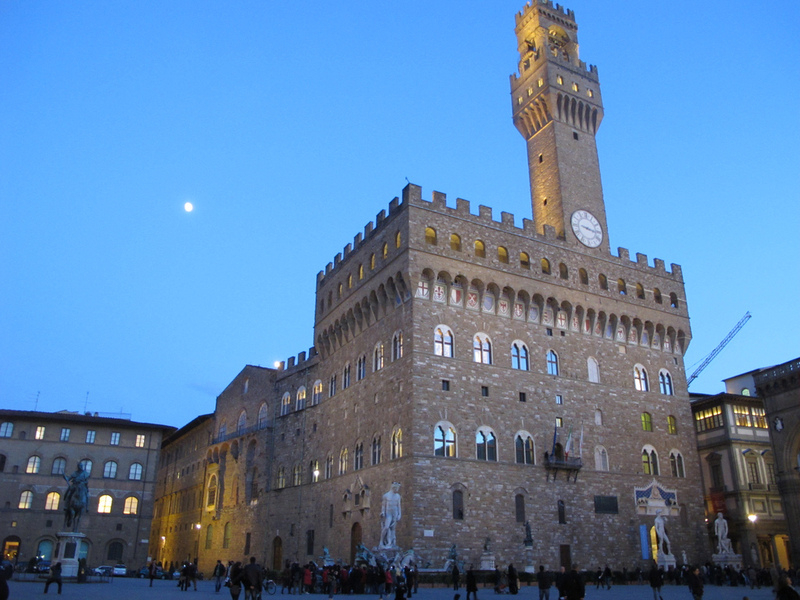 Palazzo Vecchio was built in the thirteenth century and throughout history has been called in several ways: Palazzo dei Priori, Palazzo della Signoria, Palazzo Vecchio. It was designed to accommodate the Priors and the Gonfaloniere of Justice (Gonfaloniere di Giustizia), the supreme governing body of Florence, later moved to the Palazzo del Bargello. It was erected on the ruins of a palace that belonged to the Ghibelline Uberti family, expelled from the city in 1266 for its political position and remembered by Dante Alighieri in his Divine Comedy. The historical conflict between the Guelphs and Ghibellines, who inflamed the Florentine politics at the time of Dante, is also present in some architectural elements of the building: the gallery has a square battlement defined as “Guelph”, while the tower has a dovetail battlement, called “Ghibelline”. The magnificence of this building, typically medieval, is due in large part to the design of Arnolfo di Cambio. The richness of the interior is instead due to Giorgio Vasari, who also designed the Salone dei Cinquecento, the Studiolo of Francesco I, the Apartments of Eleanor and the Apartments of the Elements (Quartiere degli Elementi). Palazzo Vecchio was built in the style of civil architecture of the time, and with its simplicity and strength embodies the ideals of freedom of the communal Italy. The present appearance of the Palazzo Vecchio is the result of many complex changes that have occurred over the centuries. The tower is decentralized because the project took advantage of a pre-existing tower. The foundations rest on an ancient Roman theater where excavations are not yet finalized and still reveal unexpected secrets: among other things, the remains of a young boy were found recently in the excavations. As a center of power in the city of Florence Palazzo Vecchio assumed different functions depending on the historical and political period. In the mid-sixteenth century it was the residence of Cosimo I de’ Medici, who, with the help of artists such as Vasari and Buontalenti, extended the building to double its size. It was when Prince Cosimo I moved his residence to the new Palazzo Pitti, that Palazzo della Signoria (namesake of the Piazza della Signoria in which it is located) changed its name to Palazzo Vecchio (old palace). Between 1865 and 1871 Florence was the capital of Italy and Palazzo Vecchio became the seat of government. Today it houses the seat of Florence town hall and a precious museum. Each room of the Palazzo Vecchio is rich in history and secrets, some of these have not yet been resolved. The magnificent Salone dei Cinquecento was commissioned by Girolamo Savonarola in the short period in which held power in Florence before being executed as a heretic in 1498 right in Piazza della Signoria. In 1504 one of the most important artistic disputes in history took place in the Salone dei Cinquecento: Leonardo da Vinci and Michelangelo Buonarroti were summoned to fresco the Council Hall with scenes of two key battles in the history of the Florentine Republic, The Battle of Anghiari (La Battaglia di Anghiari) and The Battle of Cascina (La Battaglia di Cascina). The artistic result of the affair was limited: Leonardo painted a fresco beautiful but very delicate due to the experimental technique used, and Michelangelo never realized his work. Only evidence that remains of the two masterpieces are the preparatory drawings and stories of the time, who handed down the memory of a battle between two giants of the Italian Renaissance. The present appearance of the Salone dei Cinquecento dates back to the Grand Duke Cosimo I, who commissioned the decorations to Vasari. Until recently it was believed that under the frescoes of Vasari was hidden Leonardo’s masterpiece, but many experts and art historians have categorically ruled out this possibility. The wonderful frescoes that decorate the coffered ceiling, as well as all the decorations of the hall, are rich in symbols and religious references and were intended to exalt the greatness of Cosimo I and the Medici power. Some of the masterpieces housed in this room are The Genius of Victory (Genio della Vittoria) by Michelangelo and the famous cycle of the Labours of Hercules (Fatiche di Ercole). Palazzo Vecchio is an amazing museum, from its entrance. In front of the façade stand out in their beauty statues of the Marzocco and a copy of Judith and Holofernes (the original is now in the Bargello Museum), both masterpieces by Donatello. The copy of the statue of Michelangelo’s David which is the guard of the building since 1504 – the original is kept at the Galleria dell’Accademia – is the symbol of intelligence and strength of municipal institutions able to overcome tyranny. The set of coats of arms on the facade is a unique testimony of medieval Florence and its balance of power, translated into symbols and references. The tower, called Torre di Arnolfo, dates back to 1310 and hides a compartment that was used as a place of imprisonment of Cosimo the Elder, sentenced to exile, and Savonarola, who was sentenced to death in 1498. One of the three bells in the tower, affectionately called Martinella, is very dear to the Florentines, because it has always had the function to call to citizenship in the assembly. The walls of the Palazzo Vecchio are rich in inscriptions and plaques, some with trivial indications for citizenship, such as the one prohibiting the use of water of the Fontana del Biancone (Fountain of Neptune). The most curious of these recordings is that attributed by tradition to Michelangelo, which would have carved the face of a man condemned to death during one of the many public executions that took place in Piazza della Signoria. Palazzo Vecchio has several entrances including the Porta della Tramontana (North Wind Gate), the Porta della Dogana (Customs Gate) and the Porticciola (Small Gate), connected to a secret staircase and built by the Duke of Athens to ensure an escape route in the turbulent years of its rule. In the courtyard are painted symbols of the Guilds of Florence, and there is a fountain with a statue of Little Angel with Dolphin (Putto con delfino) by Andrea del Verrocchio. Other two courtyards are the Cortile della Dogana, now home to the Museum Ticket Office, and the New Courtyard, built by Bartolomeo Ammannati. The Studiolo of Francesco I is a masterpiece of Vasari located on the first floor of the building. It is embellished with art works by Ammannati and Giambologna: the Grand Duke kept here all that intrigued him, and objects more private. The other stunning rooms of the museum are named after the gentlemen and noblewomen who made great the House of Medici over the centuries: Pope Leo X, Cosimo the Elder, Lorenzo the Magnificent, Cosimo I, Giovanni dalle Bande Nere, the only mercenary soldier leaders of the Medici family, and Pope Clement VII. The Chapel of the Signoria (Cappella dei Priori) is famous mostly for having accepted Fra Savonarola in prayer for a moment before being burned alive in Piazza della Signoria. The Audience Hall and the Hall of Lilies are richly decorated with works by Benedetto da Majano, Ghirlandaio and wooden doors with images of Dante Alighieri and Petrarch. Palazzo Vecchio also houses the death mask of Dante. 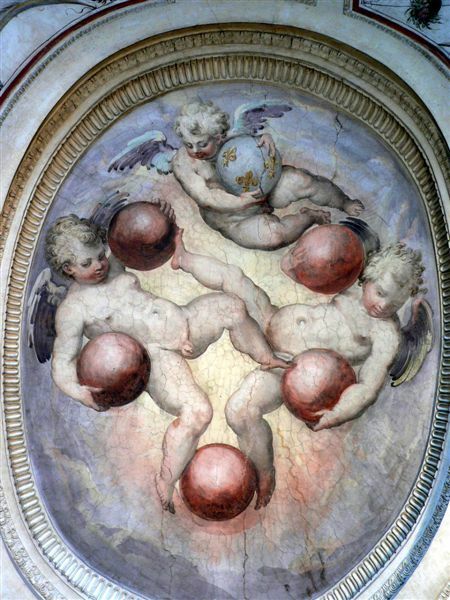 The Hall of Geographical Maps or Wardrob was the place where the Medici guarded their most valuable goods, and today retains wonderful geographical maps and a famous globe. The Vecchia Cancelleria (Old Chancellor’s Office) is known for hosting Niccolò Machiavelli when he was Secretary of the Florentine Republic. The Mezzanine now houses the Loeser Collection. Access to the tower is not permitted for children under 6 years and is suspended in case of rain. NB – The cost of the tickets may vary during special events or thematic exhibitions. N.B. – Tickets are valid for six months. Purchasing a guided tour you usually have the skip the line tickets cost included in the total price of the tour. 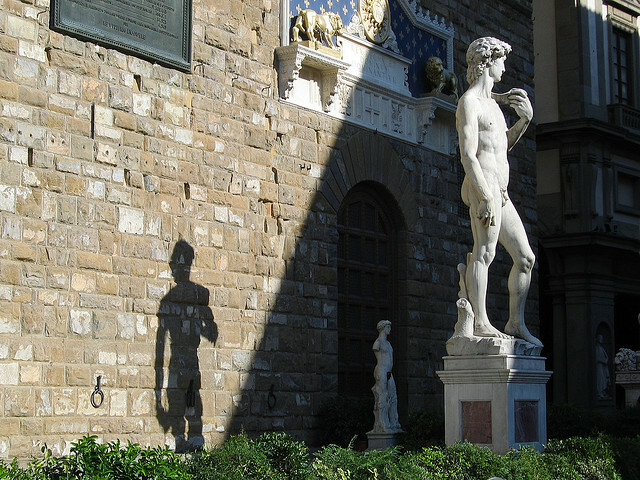 The Inferno tour — a Florence walking tour provided by Florence Inferno — includes a guided visit of Palazzo Vecchio and its secret passages. Florence Inferno also provides customized tours in several languages. October 2015: the new Opera del Duomo museum finally inaugurated!